I think having a special place just for writing is important. Sadly, I chose (too often) to make that special place in my bed. XXXXXXXX NOPE! Wrong! Go directly to jail! About a year ago, I brought my childhood desk to my own home. It was an antique that had been my aunt's. In her ownership, whitewashing had been all the rage. 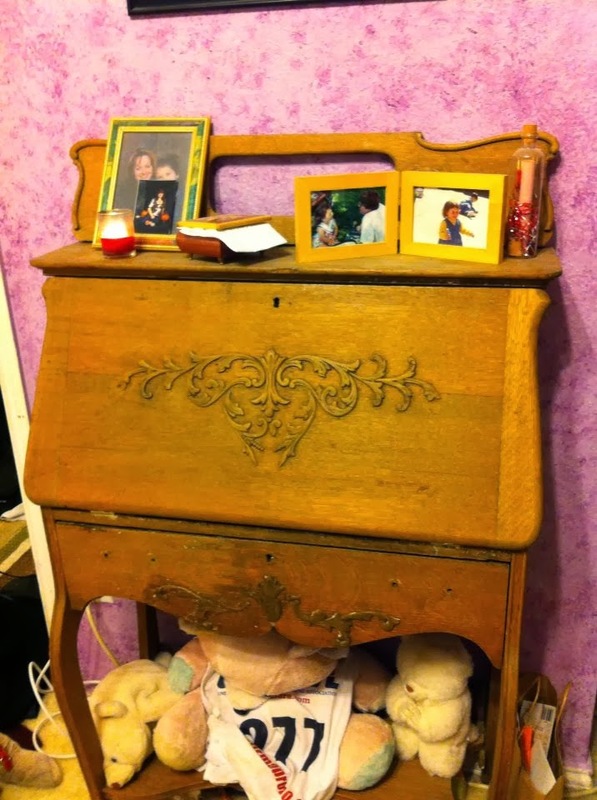 In mine, restoring furniture back to its original lovely wood was the thing to do. It's easier to slap white wash on than to remove it from every nook and cranny. Grrr. But, I digress. I hadn't quite finished the restoration started in my 20s, and here I am in my 40s. I didn't care. 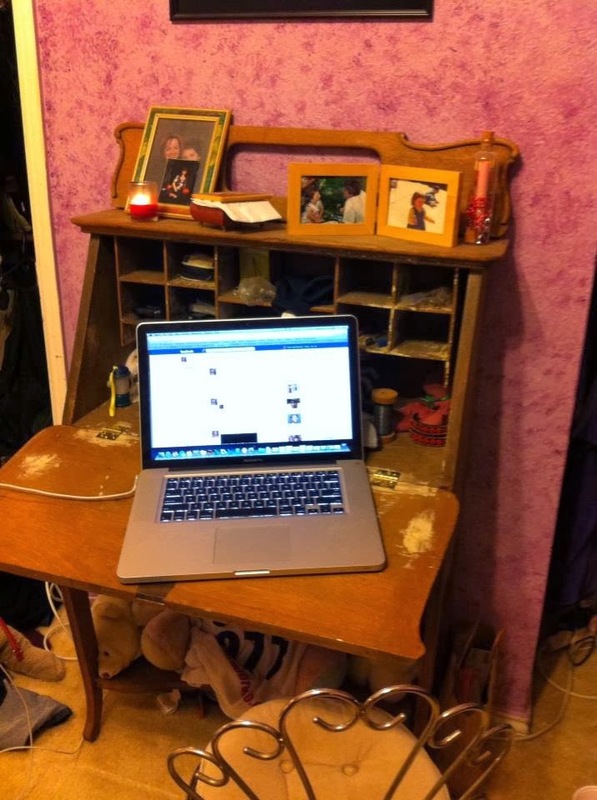 I loved my little desk, and I wanted it. So, I packed it and all the pieces still un-reattached, and brought it to a place in my bedroom, just like when I was growing up. While I was working on my MFA in Creative Writing (go Full Sail Univeristy! ), I occasionally worked at my little desk, but I didn't make it a habit. I still found myself back on my bed, either laying, lounging, or sometimes kneeling at the side of the bed. And what happened is that my sleep and my rest suffered. I've read tons of those studies and articles about good sleep. Don't do other things in your bedroom that take away from your rest. I ended up surfing the internet when I should have been sleeping. I found myself up until 4:30 a.m. and 5:00 in the morning. All the while, my sweet little desk sat quietly. I've even noticed more problems with my already not-so-great back and with my calves and hamstrings getting tighter. But, I continued to lie in bed or sit on my bed. Oh oh..have I mentioned that I have an OFFICE with a desk and a desk top computer? Yeah. It's ridiculous, and I acknowledge my part in it. However, a special writing spot is different. It's different for me, anyway. The other night, I moved my charger and my laptop back over to my desk. 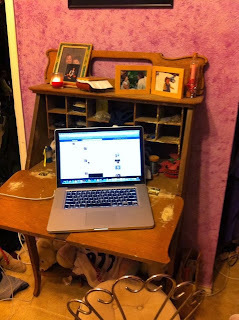 Even before 2014 starts, I want to get back into the habit of using my darling desk. I am currently about 48 hours into the writing desk only phase of my writing. Writing feels like it's own, very special activity now. I feel like I'm productive and working. I also feel like I am in a sacred space, sharing a piece of my family's furniture with generations of women before me. Do you have a special space? If you do, I'd love to see it! If not, go create a space now. Enjoy it. Well, my book is not yet published because my publishing house is having a challenge getting an illustrator. At one time, two illustrators were interested, but since I'm not on the business side as an author, I don't really know any details. What I do know is that my little Baxter mouse is still waiting for me to write more stories and for the rest of the publishing process to continue. I've had a lot of feelings about this. I've been very angry and disappointed. I've also been desperate and sad. In between, I've felt the call of a challenge. What is it that I can do? I'm not an illustrator, so I won't be creating my own art. I'd like to, but I know my creative and time limitations. Plan B was to get published in anthologies and write on more Baxter stories while the house locates an illustrator. (There are really good people who are trying to work miracles behind the publishing house doors.) But, I'm still no closer to getting published than the day I signed my contract last March. However, as we were taught in my master's program and as I have experienced as an entrepreneur - keep many options available. As writers, we should not have all of our dreams banked on one piece. I actually have a couple of other books in the works. Several of them are children's books. One is not. And honestly, I have a previously published article that I have been expanding for an ebook. So, there ya go. I have two other projects to work on. My publishing house is really cranking out books, though. I've watched a number of authors see their books selling in multiple markets. So, I think Plan C might be to look at my nonfiction books, started a couple of years ago and tabled once I started writing children's books with my classes. It seems to be a reasonable plan to focus on those texts, which deserve to be told, and send them to be published since I know that they have fewer requirements for the house to handle. So, I'll send in something that I know they can handle with a bit more ease. Cool! There are many circumstances out of my control - and even out of the control of my publishing house - but I can continue to keep writing. I can keep looking for the opportunities in front of me.